The California Articles of Incorporation of a Common Interest Development Association | ARTS-CID must be filed with the California Secretary of State before it becomes an active corporation. This is one of the most important submittals since it will solidify such facts as the address of the corporation, location, and purpose with the State of California. In order to successfully file you must include a payment for the filing fee. The filing fee is $30.00. This may be done by mail or by in person however, if dropping off in person you must also include a $15.00 service charge. You will have the option of receiving a certified copy for an additional $5.00. If you do not wish to receive a certified copy of the articles you have submitted, you will receive an uncertified copy free of charge. You mail the completed articles to Secretary of State Business Entities, P.O. Box 944260 Sacramento, CA 94244-2600 or hand deliver them to Secretary of State 1500 11th Street, 3rd Floor Sacramento, CA 95814. It is important to note, the act of filing these articles does not automatically qualify an entity from any sort of tax exempt status. The newly forming corporation must contact the I.R.S. 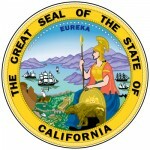 and the California Franchise Tax Board separately for an assessment as to whether it will qualify for this. There may be additional governing entities requiring documentation depending upon the exact nature of the corporation. If there is any question regarding this process, it would be considered wise to consult a professional for more information. Step 1 - Enter the name of the Common Interest Development Association on the space provided in Item 1. This name must be available for use and may not be currently used by another entity. Additionally, it may not be misleading in any way. Step 2 - In the section labeled “Corporate Purpose,” indicate if this corporation falls under the Davis-Stirling Common Interest Development Act or the Commercial and Industrial Common Interest Development Act by placing a check mark in the appropriate box. Step 3 - In the “Service of Process” section identify the adult that has accepted the responsibility of receiving court documents on behalf of the corporation being formed in the event this entity is sued. Report the Name of this party in Item 3a. Report the Address of this corporate agent in Item 3b, if this corporate agent has not been previously registered. Step 4 - Report the Street Address of this corporation in Item 4a, and the Mailing Address in Item 4b if it is different from the corporation’s street address. If the corporation has a separate Business or Corporate Office of Common Interest Development, this should be listed in Item 4c. It this Business or Corporate Office of Common Interest Development is not physically on the site then list the front street and nearest cross street to the common interest development’s physical location in Item 4d. Step 5 - If this association has a Managing Agent, report his/her Name, Address, City, State, and Zip Code on the blank line in Item 5. 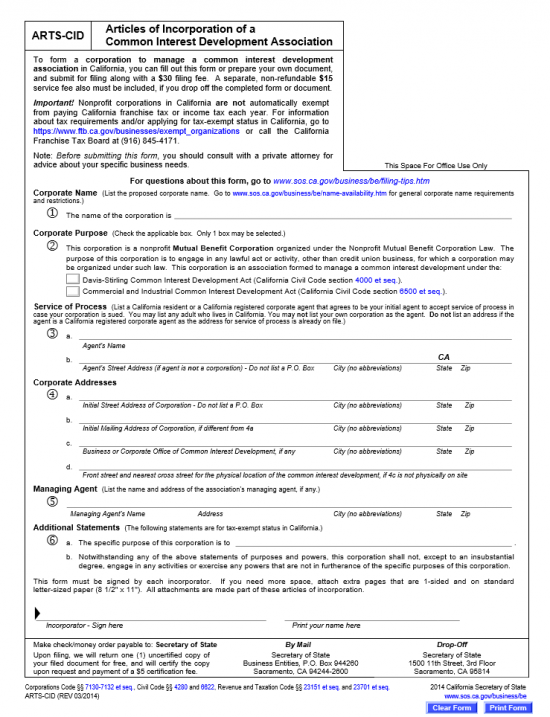 Step 7 - In order for these articles to be submitted properly this form must be signed by each Incorporator. Also, each Incorporator must print his/her name adjacent to the respective signature. 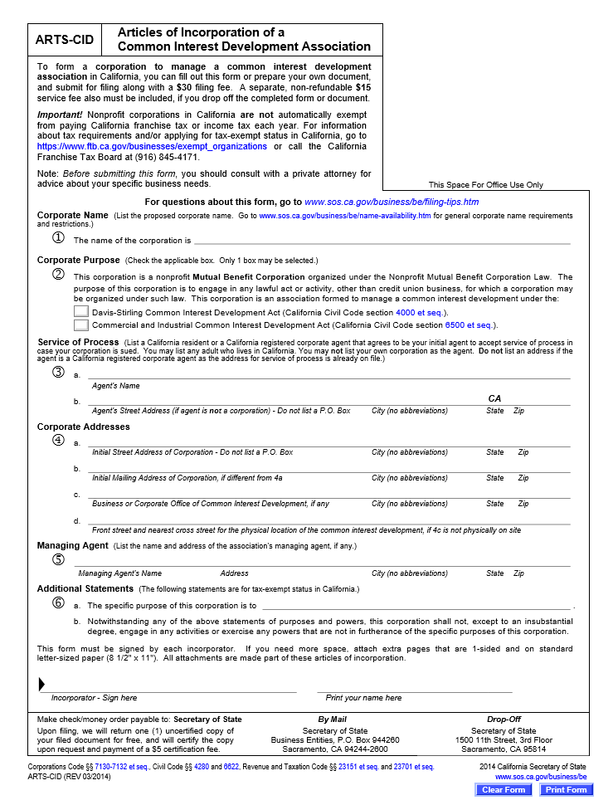 If there is not enough room at the bottom of this form, then attach another sheet of paper with the continued Incorporator signature line list.